KWU certainly delivered chaos to the Friends Falcons. Quarterback Johnny Feauto scored six times, the defense and special teams combined for three touchdowns, and No. 21 Kansas Wesleyan put up a school record 83 points in an 83-0 blowout at the Graves Family Sports Complex. The previous record was 72 when the Yotes dropped 72 against Southwestern in 2010. KWU also held an opponent scoreless for first time since 2015. After back-to-back punts to start the contest, Friends quarterback Dan Dawdy pulled back to throw and lost the ball, picked up by senior Mitch Persinger, who delivered the ball to the goal line for a 25-yard score. Feauto took over from there to leave the Falcons in the dust. After a pick by Scott Helsper, Feauto found junior Trenton Poe-Evans for a 39-yard TD. On the next drive, Feauto used his legs, sprinting into the end zone on a 44-yard run. To close the first frame, Feauto threw TD strikes of 29 and 60 yards to sophomore Charlie Simmons and junior Johnny Carmack, making the advantage 34-0. Friends started the second stanza with a push to KWU territory with a new quarterback in Colt Smith. The lefty freshman zipped a pass left toward the goal line. Wesleyan junior Rashaan Broomfield intercepted the pass at the three and sprinted 97 yards the other way for a pick-six, making that the BE Wealth Play of the Game. The ball continued to bounce the Coyotes’ way when the Falcons sent in a new punter after stalling on a drive. The low kick went to Poe-Evans at midfield. The returning All-American took it to the house for a 50-yard score. Feauto added TD passes of 25 and 33 yards to Poe-Evans and Simmons while junior tailback Demarco Prewitt scored on a nine-yard scamper to balloon the lead to 69-0 at the break. Junior halfback Jerrod Ferguson had the record-breaking score, capping a 14-play, 85-yard drive with a two-yard plunge with 8:19 left in the third. Senior Kobee McCorkle had the final TD on a one-yard carry after a 59-yard dash right before. 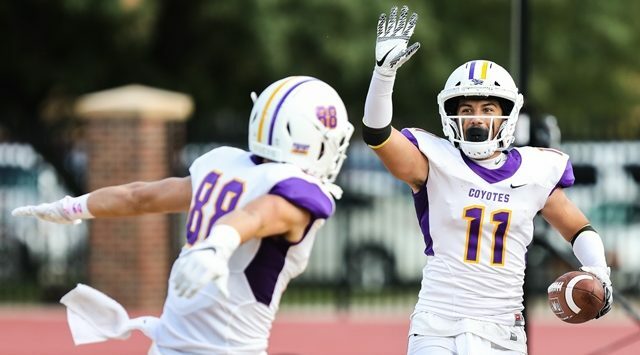 KWU racked up 591 yards on 61 plays while the defense held Friends to 153 total yards on 63. At the half, the Coyotes had 324 yards on 10 completions while the Falcons had 86 yards on 46 combined plays. FU was just 3-of-18 on third downs. Feauto had those 10 completions out of 15 attempts, throwing for five TD’s and rushing for another. Simmons had three catches for 80 yards and a pair of scores. Poe-Evans pulled in three balls for 71 yards and two TD’s. Carmack reeled in two footballs for 105 yards and a score. Kansas Wesleyan (2-0, 1-0 KCAC) heads to Sterling next Saturday to face the No. 17 Warriors (1-1, 1-1). The Lambert Insurance Pregame Show begins at 5:30 on FM 104.9, ksal.com & Rocking M Media app.